Essential Frederick Buechner reading on vocation and calling. I noted in a recent post that Parker Palmer has some rich thoughts for those asking questions about vocation and calling in his book, Let Your Life Speak. In particular, I appreciate how Palmer understands vocation as that which you can't not do. But as much as I appreciate Palmer's work, I think the Presbyterian minister and writer Frederick Buechner helps move the conversation forward. In his refreshingly witty spiritual lexicon, Wishful Thinking, Buechner points out that the English word "vocation" comes from the Latin word vocare, "to call," which "means the work a person is called to by God" (Wishful Thinking: A Seeker's ABC, 118). "Calling" assumes a caller. As Buechner notes, for the Christian, this Caller is the living God. What makes hearing this call so difficult is that God's voice is not the only voice calling out to us. The challenge is to hear God's voice in a cacophony of voices. "There are all different kinds of voices calling you to all different kinds of work, and the problem is to find out which is the voice of God rather than of Society, say, or the Superego, or Self-Interest" (118). "By and large a good rule for finding out is this: the kind of work God usually calls you to is the kind of work (a) that you need most to do and (b) that the world most needs to have done. ... The place God calls you to is the place where your deep gladness and the world's deep hunger meet" (118-19). A good way to think about calling, Buechner suggests, is as the intersection between your deep gladness and the world's deep hunger. According to Buechner, calling involves both a look inward and a look outward. Like Palmer, Buechner assumes a certain amount of introspection is involved in discerning God's call. Specifically, Buechner encourages those with questions about calling to think carefully about that which satisfies their deepest desires. But Buechner insists the call of God is not merely Self-Interest. So whatever this deep gladness is, it's not selfish ambition. Buechner is referring to something much deeper. Something that's a part of who your are, who you were created to be. What he describes elsewhere as the "hidden hunger" of your life. So how is this deep gladness discerned? Palmer encourages those with vocation questions to "let your life speak." 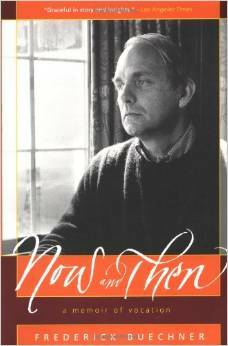 Similarly, Buechner writes in Now and Then: A Memoir of Vocation: "Listen to your life." “See it for the fathomless mystery it is. In the boredom and pain of it, no less than in the excitement and gladness: touch, taste, smell your way to the holy and hidden heart of it, because in the last analysis all moments are key moments, and life itself is grace” (Now and Then, 87). Listen to your life, Buechner insists. In the exciting peaks as well as in the deep, dark valleys. Even, perhaps, in the monotony. Where are those moments of happy tears? Where are the moments of surprise laughter? Pay attention, Buechner insists. Pay attention to those moments. Because they are telling you something deeply important about yourself. Even more, such moments are whispering something about the kind of work God has given you life to do. Elsewhere, Beuchner suggests that the way to discern your deepest gladness, the way to listen to your life, is to follow your feet. "When you wake up in the morning, called by God to be a self again, if you want to know who you are, watch your feet. Because where your feet take you, that is who you are” (The Alphabet of Grace). Buechner doesn't end his conversation of vocation and calling with a simple insistence to look inward. To stop with introspection is to miss something important. "If you really get a kick out of your work, you've presumably met requirement (a), but if your work is writing cigarette ads, the chances are that you've missed requirement (b)" (Wishful Thinking, 118-19). After looking inward, the Christian thinking about vocation and calling must look outward. Must look at the world in its most honest moments, at the nightly news with the sound turned off, at the world in all its pain and anguish and deep hunger and ask, How can my deep gladness touch this? "Think about the work of your hands, the book that of all conceivable things you have chosen to add to the world's pain. Live in the needs of the day" (The Alphabet of Grace, 40). Buechner doesn't promise that God's call on one's life will be found by thinking about the intersection of one's deep gladness and the world's deep hunger. It's a good rule of thumb, but it's not exact science. It's not like one popular young writer who offers a Venn diagram to find "your" calling. If calling assumes a caller, and if the Christian is interested in God's call on her life, and not simply her own self-reflective voice, then rules (and perhaps even Venn diagrams) are helpful as far as they go, but they're not the end. They were never meant to get us the whole way. And we would be in great danger of missing the point entirely if we ever traded following the living Lord's voice for a rule or a diagram. Which is another way of saying, Look, this will get you started. But don't be so distracted by this way of thinking about calling that you miss the One who calls when the real call comes. That would be the most pitiful irony of all. How should we think about calling, then, if rules and models will only take us so far? The German pastor and theologian Dietrich Bonhoeffer offers what is, I think the most help here, as he takes seriously the fact that the One who calls is not a God who creates and then leaves us to figure it out on our own, but a living Lord who calls us anew, daily, to himself. But first, we'll turn to a helpful distinction between two levels of calling, found in Os Guinness's book, The Call. Newer Post3 Things to Know About "Called"